Deposit #10. Join Now!Online Gambling in casinoslot-machines.net. Madrid, capital of Spain, is located in the center of the country, has more than five million inhabitants (in 2007) and is the largest city in Spain and the third largest urban area in the European Union. This city has grown throughout its history and gone annexing the villages around it such as Aravaca, Barajas, Canillas, Fuencarral, Hortaleza, Carabanchel Upper and Lower ... that were annexed in 1948. Besides the aforementioned neighborhoods, joining the villages around the center as Exeter, Majadahonda, Las Rozas, Torrejon de Ardoz, Pinto, Parla form the Community of Madrid which has a large area because it includes even Aranjuez. 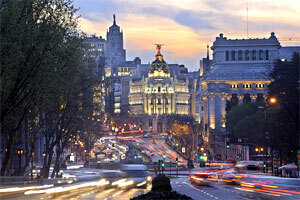 In conclusion Madrid offers many charming places attractive for the million tourists who visit every year. Madrid has several symbols that represent it as his crimson red flag that has a central seven white five-pointed stars placed in two rows and distributed four up and four down. These stars represent the stars of the constellation Ursa Minor and pentagrams are due to the five provinces surrounding the capital which are Segovia, Guadalajara, Avila, Toledo and Cuenca. Another element representing Madrid is the bear and the strawberry tree is a statue located in the Puerta del Sol and is engraved on the shield of the city and is a bear leaning against a raspberry surrounded by seven white stars on a blue background above has an old royal crown. The adjective of Madrid is the most used matritense or Madrid although historically, the locals have also been called for the cats because history as the legend that started the conquest Alfonso VI in the eleventh century (late) was achieved climbing by the wall that surrounded the city and because of the great skill that the locals had to climb acquired this name. Visiter Madrid et apprendre l'espagnol. École dans le centre de Madrid, des cours d'espagnol en Espagne. With respect to hydrography, river highlights of Madrid although not very mighty is the Manzanares river which crosses the city from the Monte del Pardo (Madrid considered and center) and passing through the districts of Carabanchel, Latina, Usera, Villaverde , Arganzuela, Villa de Vallecas Usera and slightly by the Casa de Campo. This leaves the city river flowing into the Jarama river near Rivas Vaciamadrid. Besides this river, Madrid has much water in their reservoirs and marshes of highlighting the swamp of San Juan where you made numerous water sports and competitions, the Valmayor reservoir, the reservoir of El Pardo, and reservoirs of high mountains Perryridge as reservoir or the Pinilla among others. Because it is a city, the climate is largely influenced by urban areas where they tend to slightly higher temperatures than at the periphery of the city or where there are more areas of forest and fields. The climate of this area is a Mediterranean climate, which means that the winters are quite cold with temperatures below 6 degrees, quite warm summers with temperatures above 35 degrees and spring and fall are mild temperatures with abundant rainfall . Spring is an excellent time to visit the city as temperatures are very nice and although there is the possibility of rain storms usually do not last long, it should be noted that in this station cooler at night so better bring a jacket. Getting to Madrid is very easy, as the capital of Spain has connections to major cities in Europe, with flights Madrid-Paris, Madrid-London flight, flight Madrid-Berlin, vuelosMadrid-Rome flights Madrid-Milan, among many others. Furthermore, from Madrid you can go to the tourist destinations of sun and sand more important in Spain, with vuelosMallorca-Madrid and Madrid-Tenerife flights. Madrid is also a great city for tourists thanks to the wide range of hotels in Madrid, with all the options for young, couples or families on holiday or for business. In relation to roads, Madrid inside highways has different ring as M-30 which surrounds the center of the city which is largely buried what has been done recently, M-40, which encompasses a little more territory and separates the city center to the periphery of this. As for parking must be taken into account that is set up a parking regulation called ORA, that is to pay a certain amount to be parked in a place indicated by green and blue lines, the green are used by residents but can also be used by non-resident spaces but is more expensive to park in the streets bounded by blue lines that are right for parking for non-residents. The best public transportation in the city is the metro because of its speed as it encompasses many areas of the city. In this transport as elsewhere the city is divided into zones: A, B1, B2, B3, C1 ... A being the center of Madrid and it is the most interesting area for tourism. The metro has different types of subscriptions, a single trip, 10 tickets, monthly bonuses and a bonus for tourists that last a number of days. If you want to travel between different areas has to get a combined ticket because when you exit the station you must enter the ticket and run the risk of not being able to leave if you do not buy the right ticket in addition to being fined by the reviewers that circulate in the subway asking for tickets to passengers. There are also many buses in the city but are less desirable because they are frequent traffic jams in Madrid especially on weekdays. There are many taxis in Madrid that may be another option for transportation but it is always less economical but that if much more comfortable. The best way to see a city is recorriéndotela walk up and down and therefore visit Madrid not going to be something different. The best idea to see every corner of the city offers is to use public transportation to a point such as the Puerta del Sol for example and walk recorrerte lounging around drinking a beer with a skewer tortilla in any of the cafes or bars that are in the way. The entrance is complimentary collections and temporary exhibitions are accompanied by Britain's art throughout the year. The museum is at Tate Britain Street, London, SW1P 4RG. The hours are 10:00 to 17:30 every day of the week, except for the first Friday of each month, the date on which the payment is made from ten o'clock until nine of the night. The days are not open to the public on 24, 35 and 26 December. To get to the museum you can go by boat, the Tate Boat service comes every 40 minutes connecting points of Tate Modern, London Eye and Tate Britain. You can also use the metro Pimlico and Vauxhall or bus in zone2, 3, C10, 36, 87, 88, 159, 185, 436 and 507.